The Ronald McDonald House of Southern New Jersey celebrated the 10 year anniversary of its Family Room located in the Neonatal Intensive Care Unit at Virtua Voorhees Hospital with a plaque dedication and reception on Tuesday, Sept. 15. The brief speaking program featured board members, NICU nurses and hospital administrators. 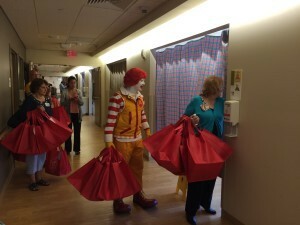 Following the program, Ronald McDonald joined nursing staff volunteers to deliver gift bags to families with infants in the neonatal intensive care unit at Virtua Voorhees Hospital. The gifts bags contained stuffed animals, children’s books and handmade cards with well wishes from families staying at the Ronald McDonald House of Southern New Jersey. The Family Room serves as a place within the hospital for patients’ family members to rest, have a snack and access the Internet. It contains a kitchen, dining area, seating and computers for families’ use and two private bedroom suites with private bathrooms. The room provides a setting meant to be uplifting and offer comfort and support to families of infants receiving medical treatment.